There is a way, to ‘truly’ experience the island. You can choose. Enjoy the ride and let our professional drivers do all the work for you. On this tour, Rhodes Adventures will take you to places you would never be able to see otherwise. You will be given an unusual and intimate look at the many facets this island has to offer. This extraordinary journey begins each morning from your hotel, and is finishing in your heart. Adults and Children: 65 euros p.p. 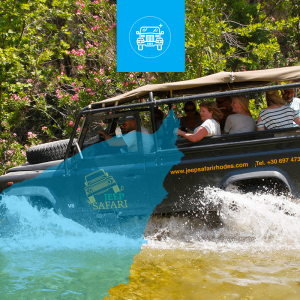 Price includes VAT 24%, cars with professional driver, gasoline, insurance, public liability, pick up from the hotel (West from Rhodes Town to Fanes, East from Rhodes Town to Kolimbia) and local products tasting. From Archangelos and further South, the South Tour applies. Price includes VAT 24%, cars with professional driver, pick up from the hotel (Archangelos and further South), local products tasting, gasoline, insurance and public liability. 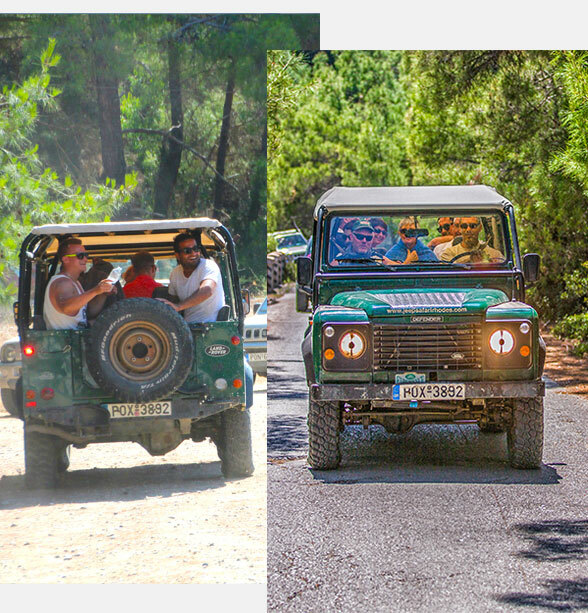 In case of safari with drivers we use Land Rover Defenders for 9 persons. These cars are as well open and closed with roll cage and a soft top or hard top and have seatbelts in the back. Minimum is 6 persons. The first route will be one and half hours of driving with a beautiful aerial view of the Butterfly area. Our first official stop will be in Archipoli for honey tasting where costumers will taste different local product such as honeys, souma, olive oil, local sweets & fresh seasonal fruits. Next, we will continue to the top of Mount Profitis Ilias from where we will have a breathtaking 360 view over the island. 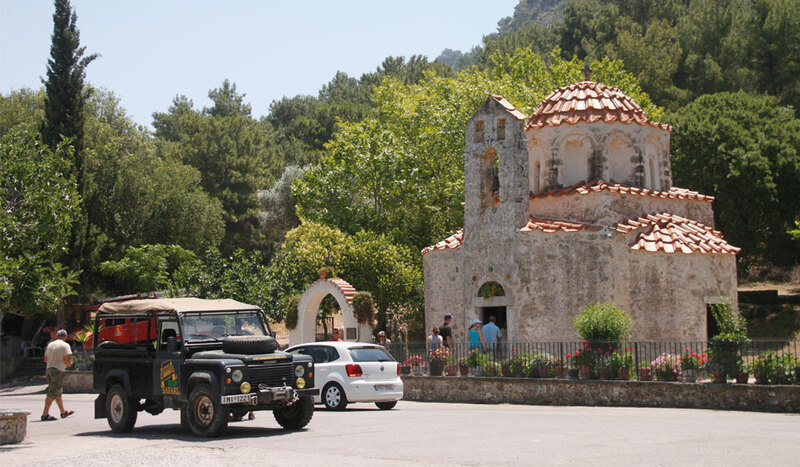 Off-roads we will drive to Apollona for a traditional Greek Meze lunch with view over the Attavyros. Lunch is optional and cost 12€ per person. Partly off-roads we will pass the villages Embona and Kritinia to end up at Kritinia Castle where guests have the chance to explore. At last we will have a short stop at the beach of Fanes where guests can take a refreshing dive before heading back towards Theologos. 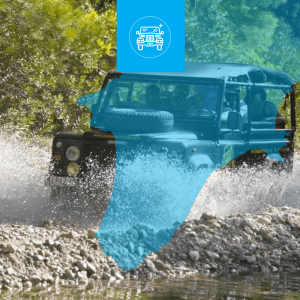 The first route will be one and half hours of driving with a beautiful aerial view over Gadouras lake. After passing through the fruit gardens of Massari / Malona we will have our first official stop in Archipoli for honey tasting. Here costumers will taste different local product such as honey, souma, olive oil, local sweets & fresh seasonal fruits. Next, we will continue over the top of Mount Profitis Ilias to arrive in the village Apollona for a traditional Greek Meze lunch with view over the Attavyros. Lunch is optional and cost 12€ per person. Partly off-roads we will continue to Gadouras Dam where the guests will have a panoramic view over the lake and can make some pictures. At last we will have a stop at the Fortress of Asklipio with a stunning view over the village and East Coast of Rhodes. From here we will drive again off-roads down to the East Coast to drop off our guests. 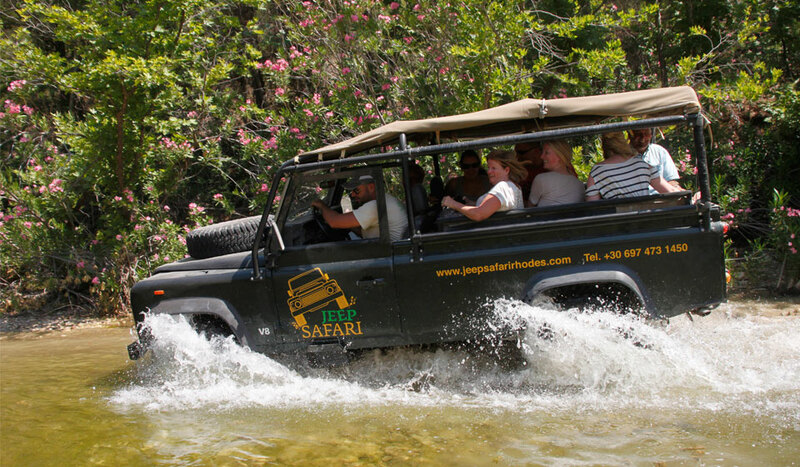 Km is the max distance of our safari tour in Rhodes!